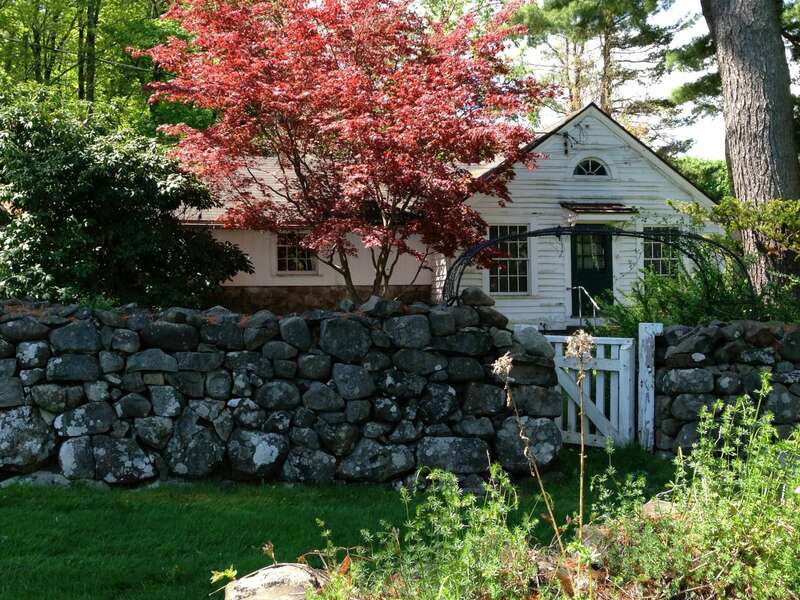 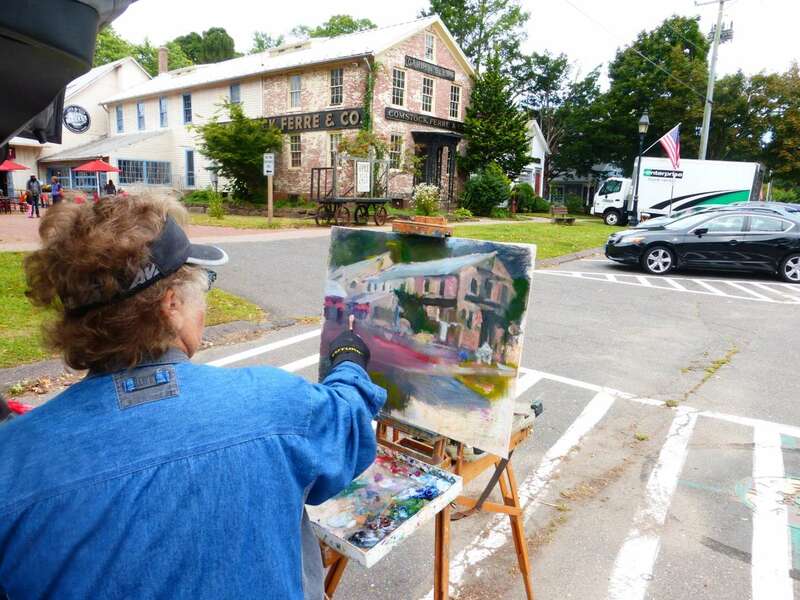 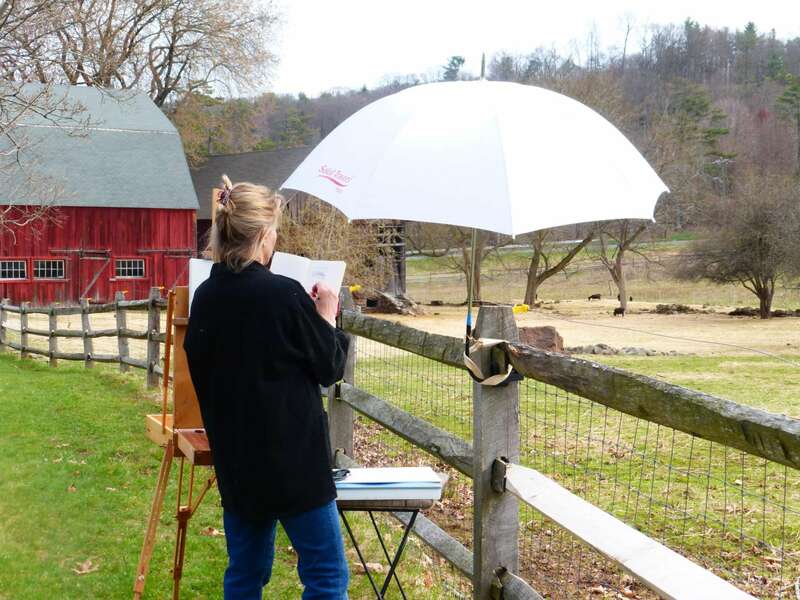 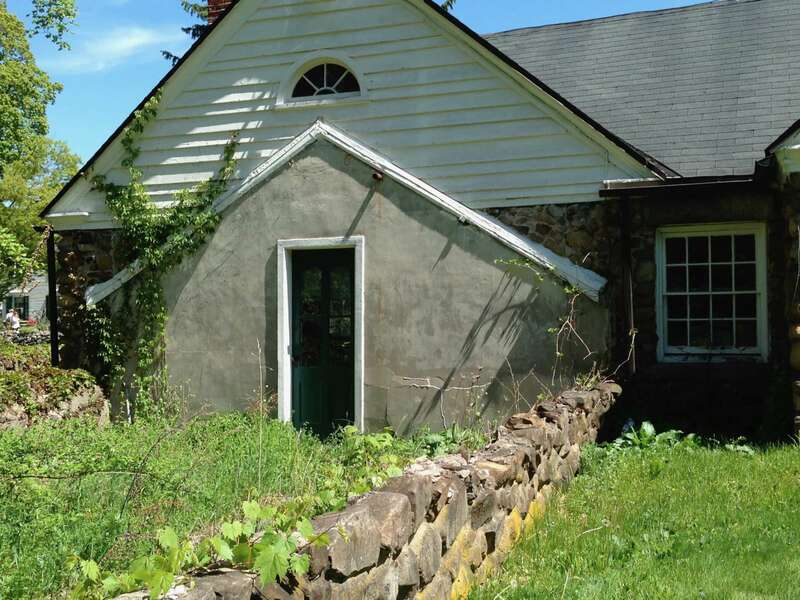 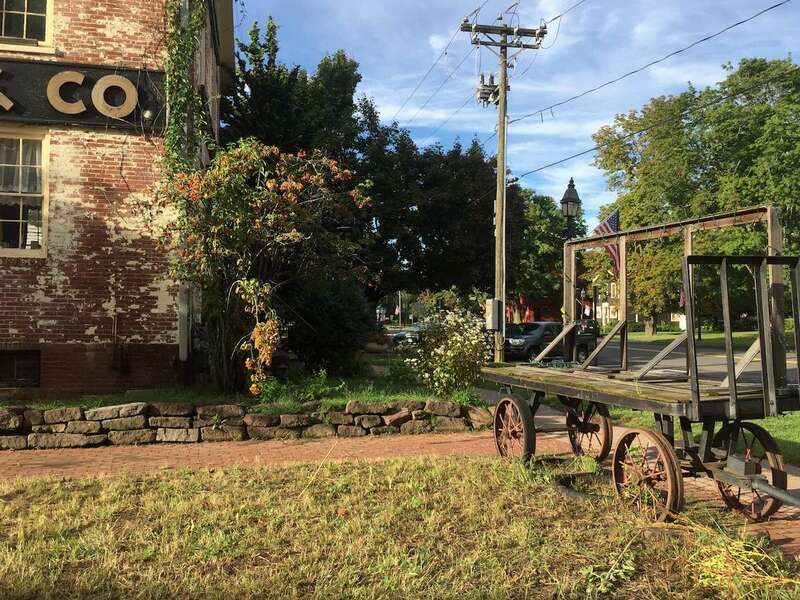 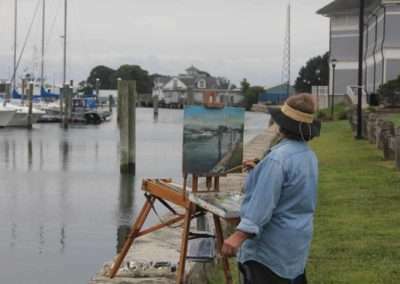 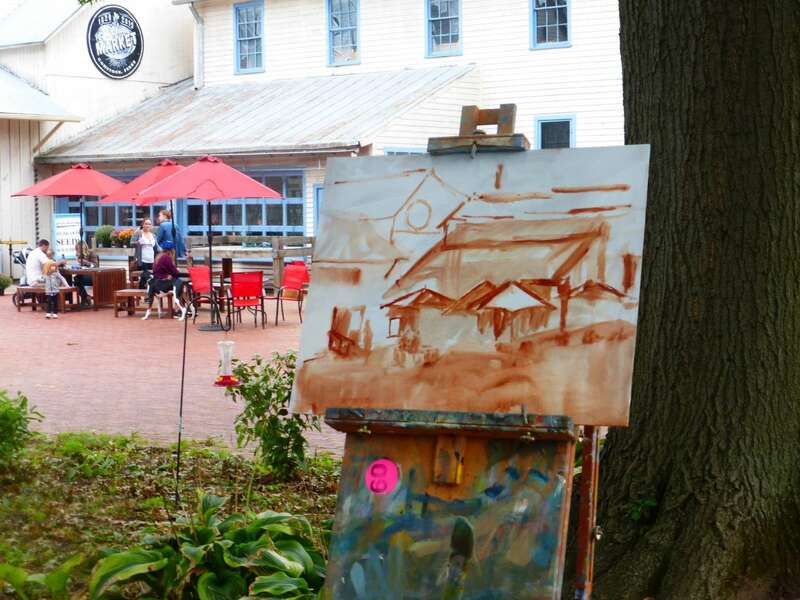 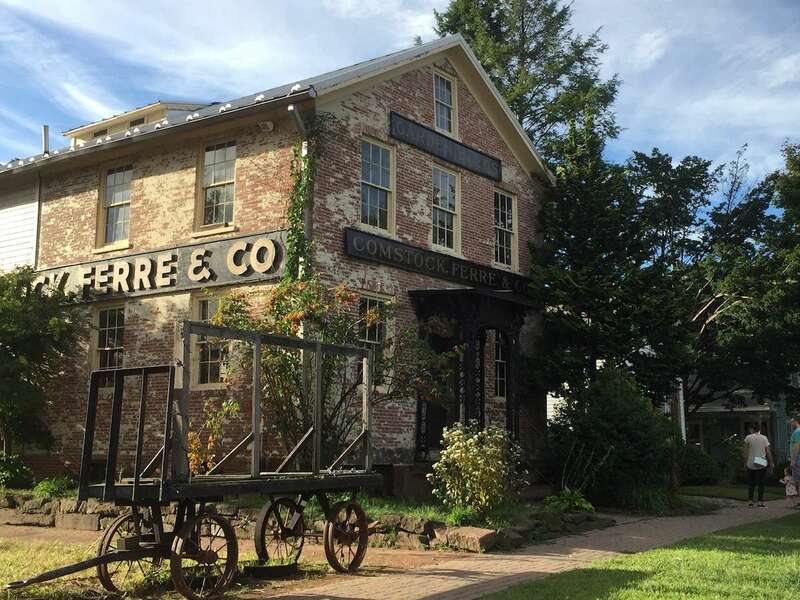 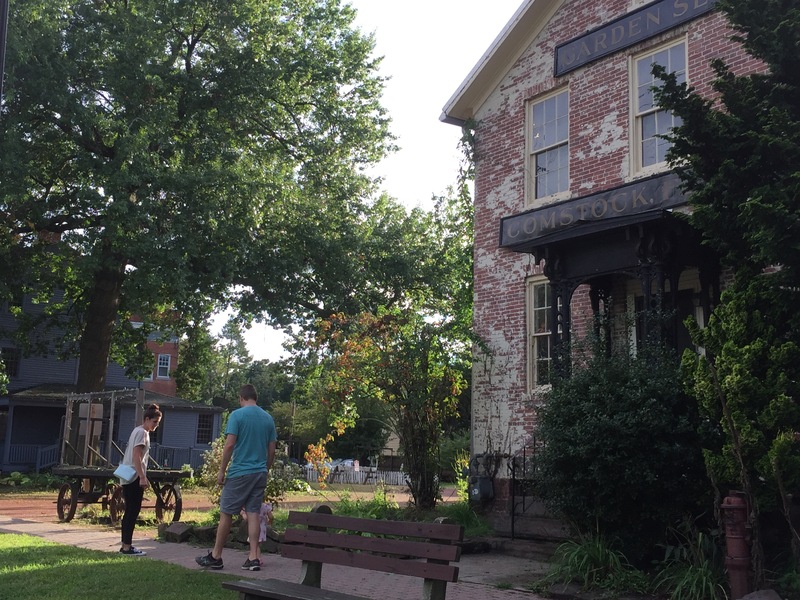 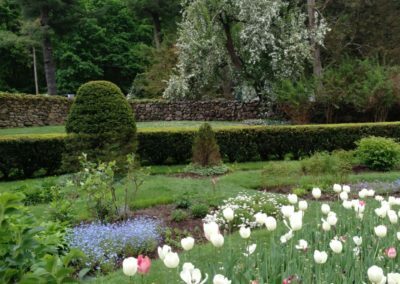 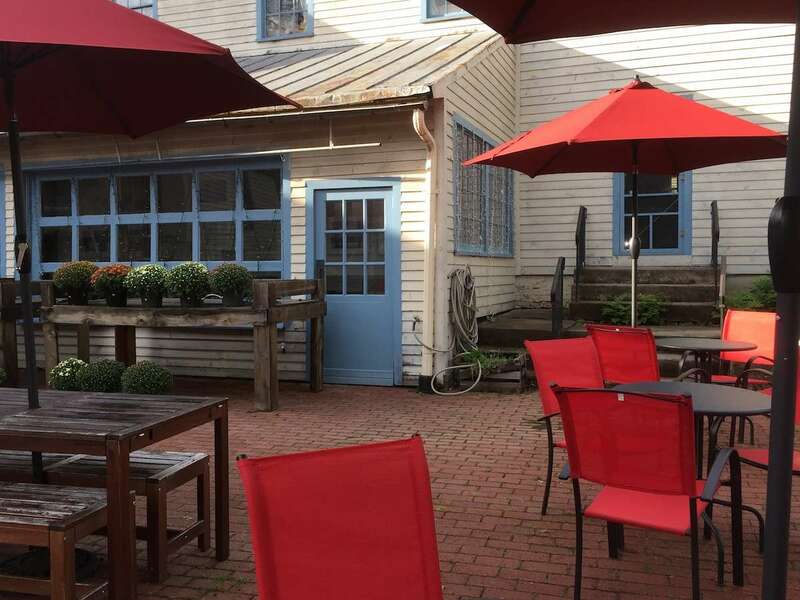 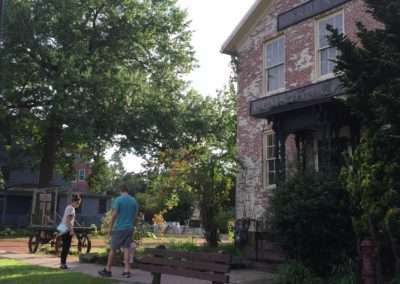 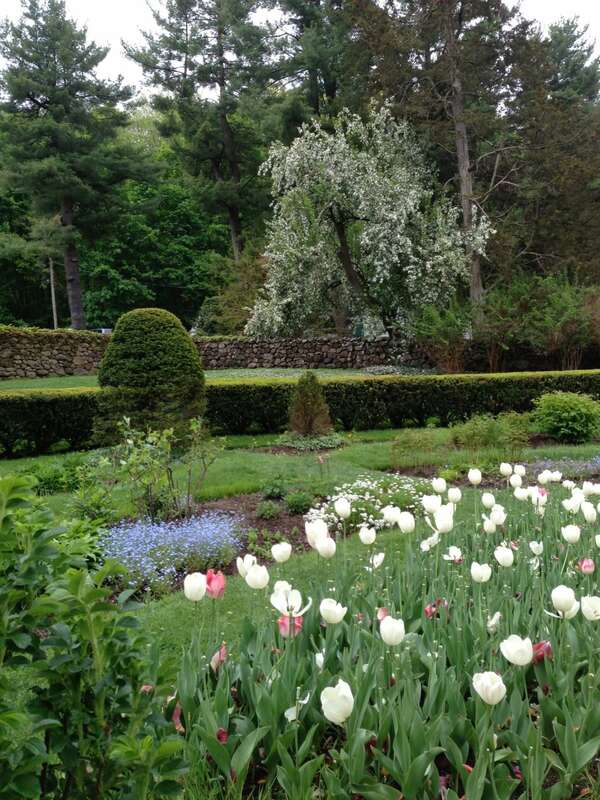 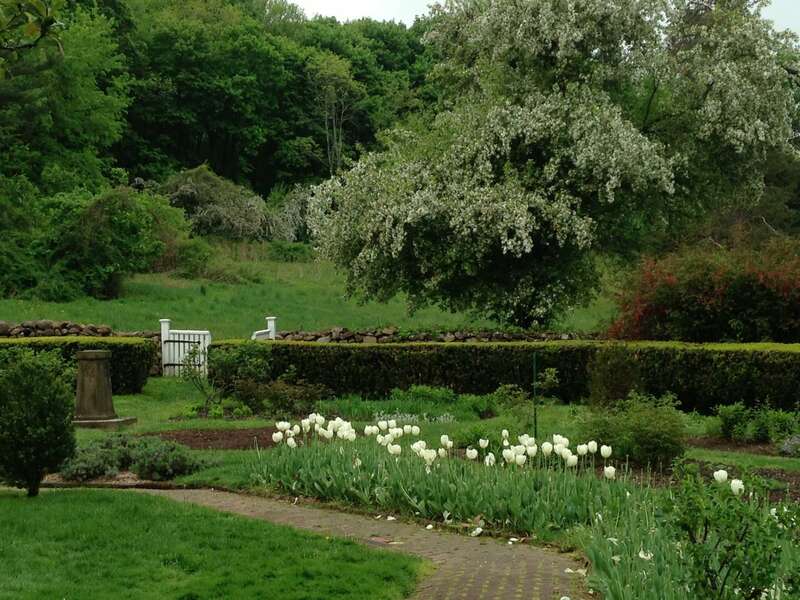 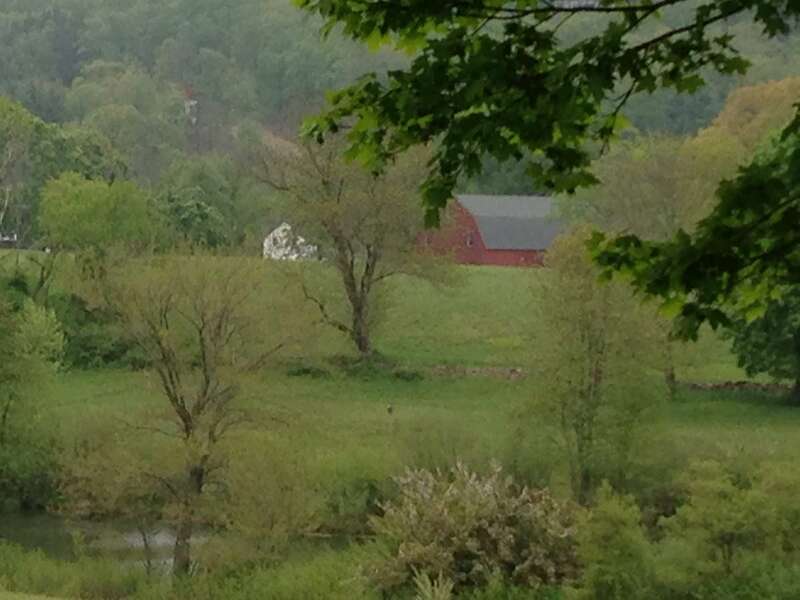 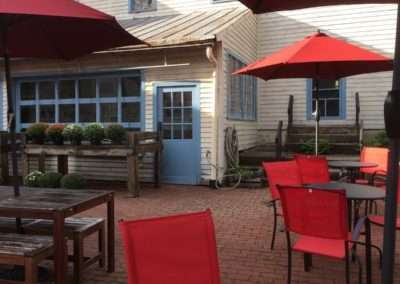 Paintouts are opportunities for plein air painters to gather at various scenic locations throughout Connecticut. 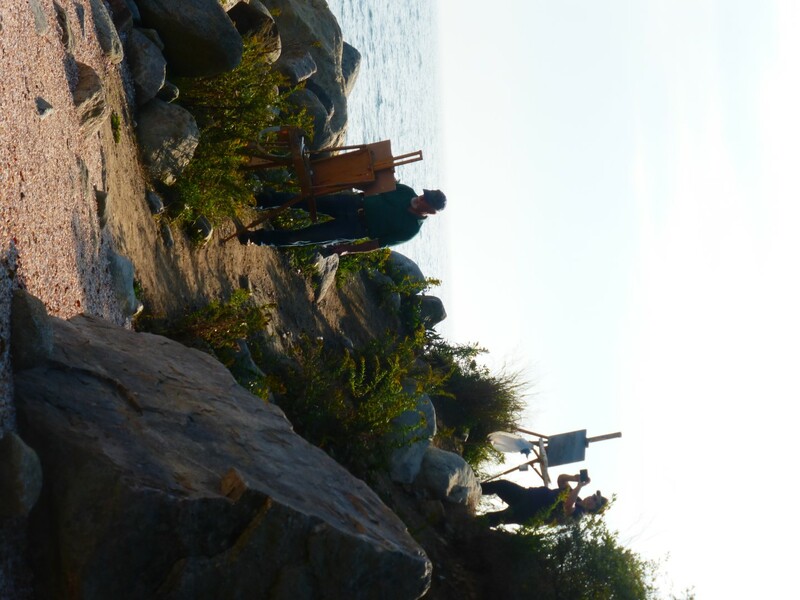 Working together provides an opportunity to make connections with other painters and learn from each other. 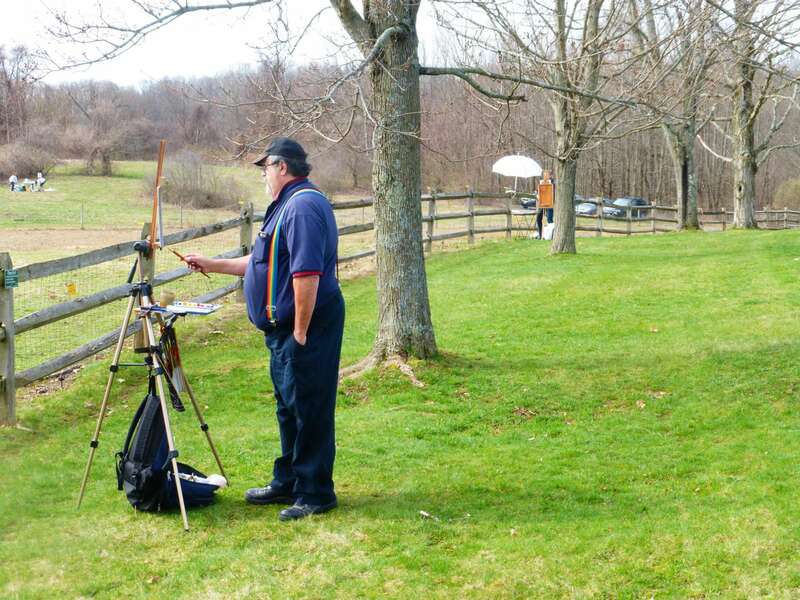 Here you will find information about our paintout schedule and view images from past paintouts. 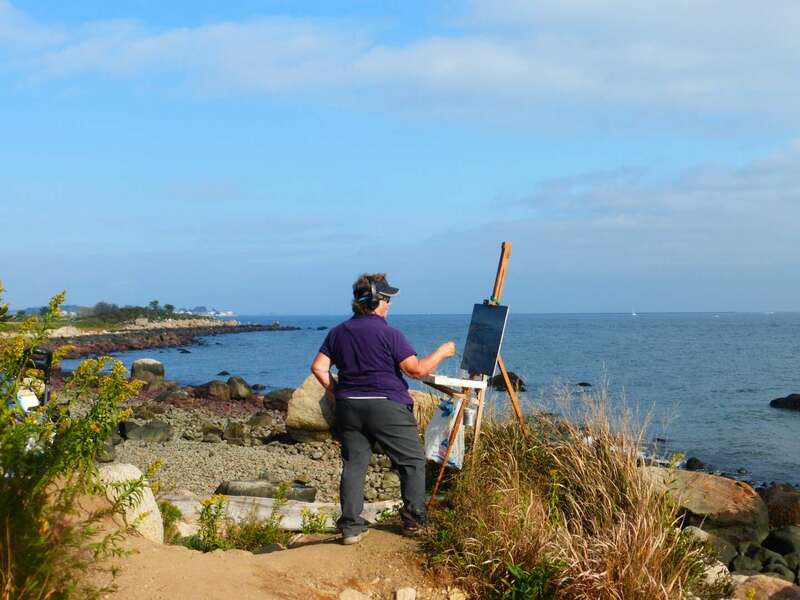 We painted at Meig’s Point in Hammonasset Beach Park last October and it was simply fabulous! 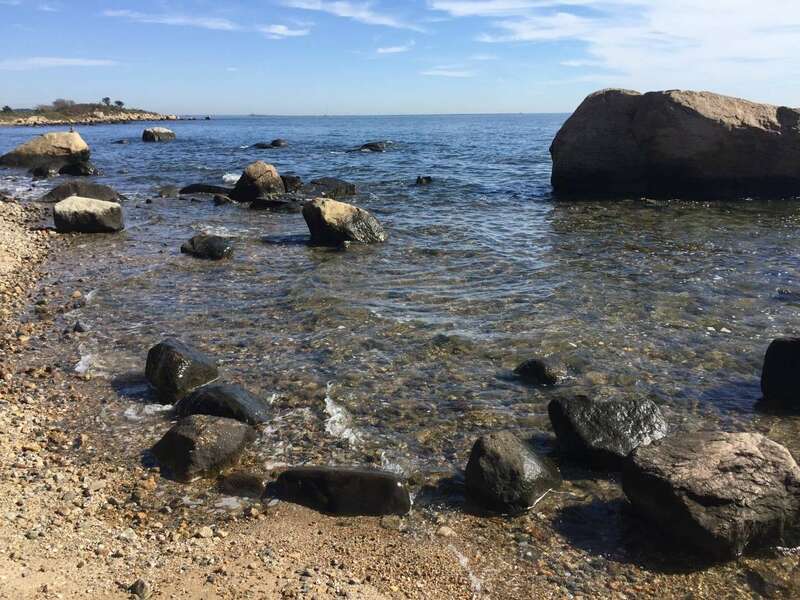 This location offers rocky shorelines, marsh meadows beginning to change color, large rocks with waves lapping onto a long curved sandy beach, all wrapped in a beautiful autumn day, (at least that’s what the weather says today). 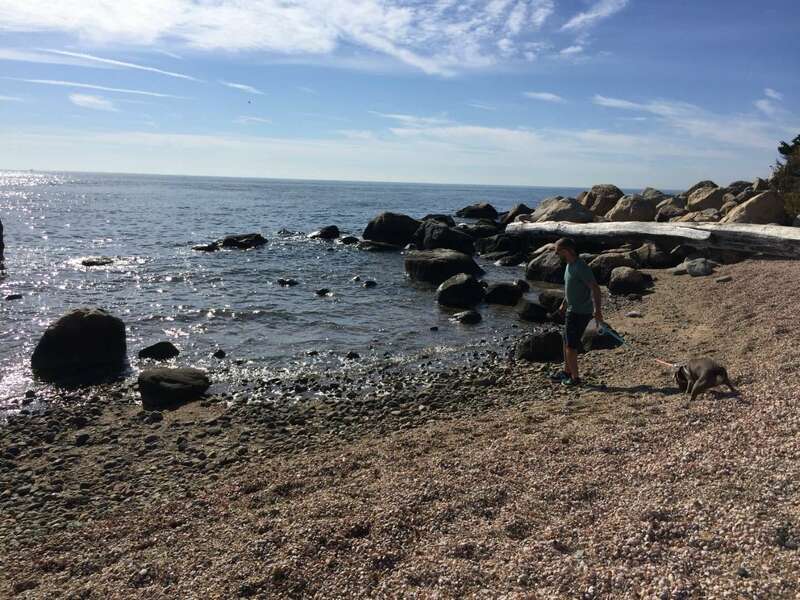 A new time: Let’s try something new! 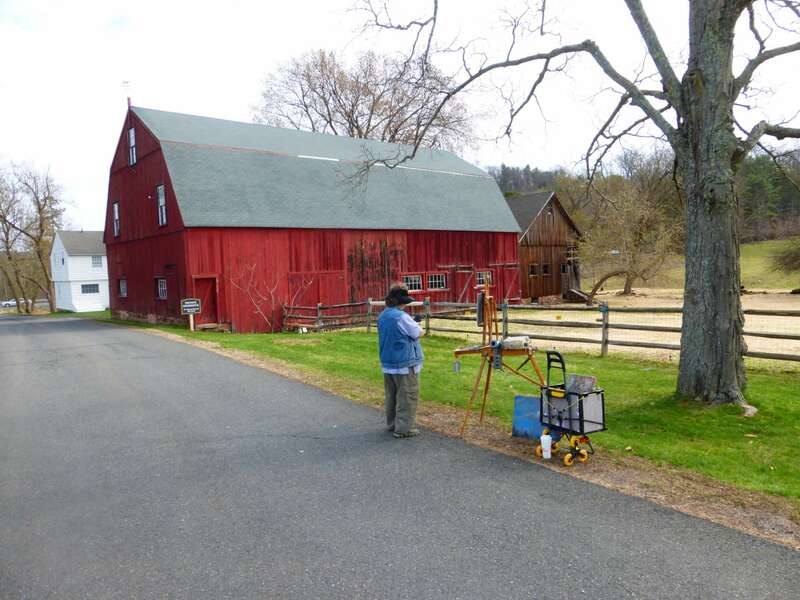 It has been proposed that we try an afternoon paint, and this location lends itself to excellent afternoon light. 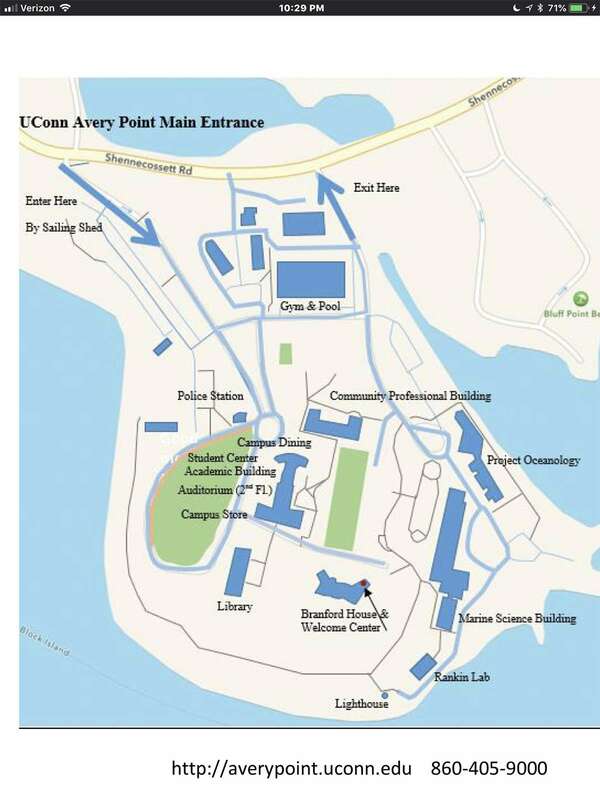 We’ll meet and sign in at the parking lot by the Meigs Point Nature Center, (see below directions), any time after 1:30 PM. 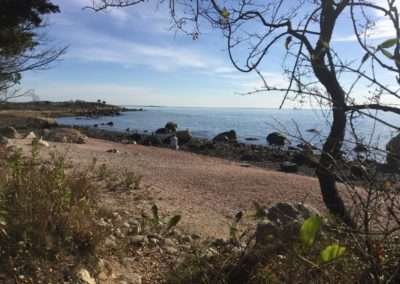 Hammonasset Beach State Park closes at sunset, which is around 6:20 PM, so we can stay until 6:00 PM. 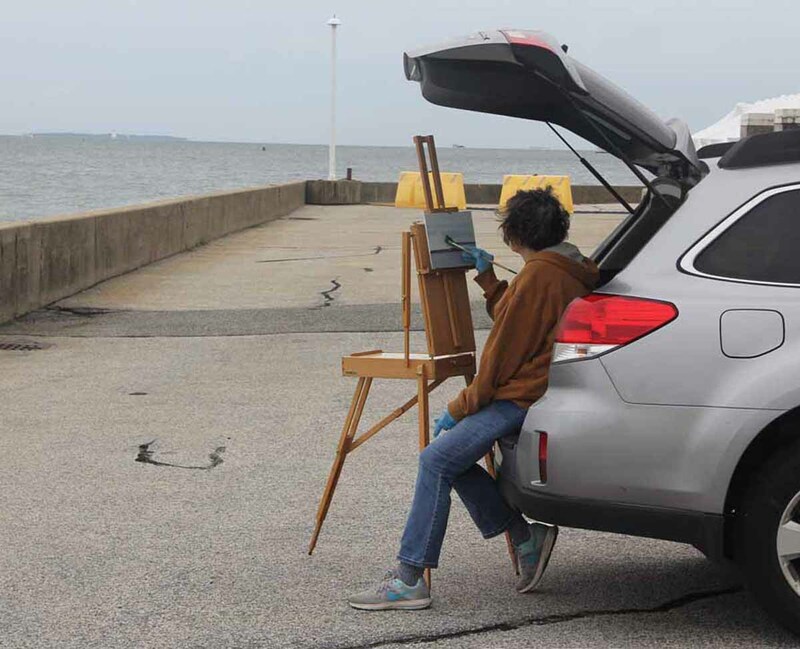 We have only one more scheduled paint out, so I hope to see you there! 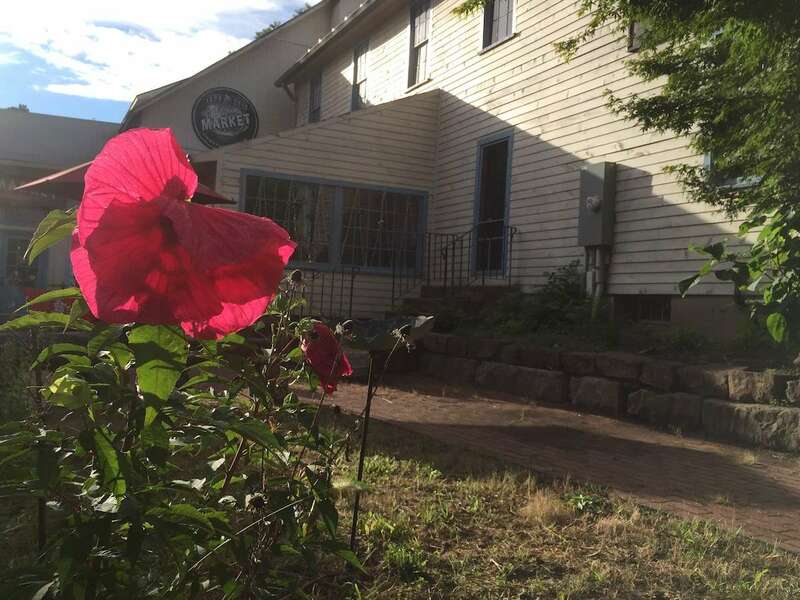 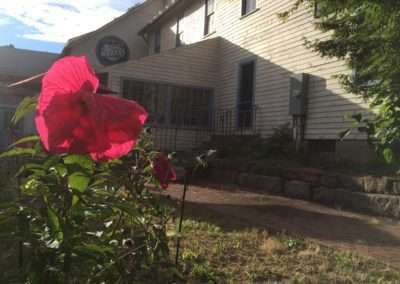 The Meigs Point Nature Center offers programs and activities for park visitors on a year round basis. 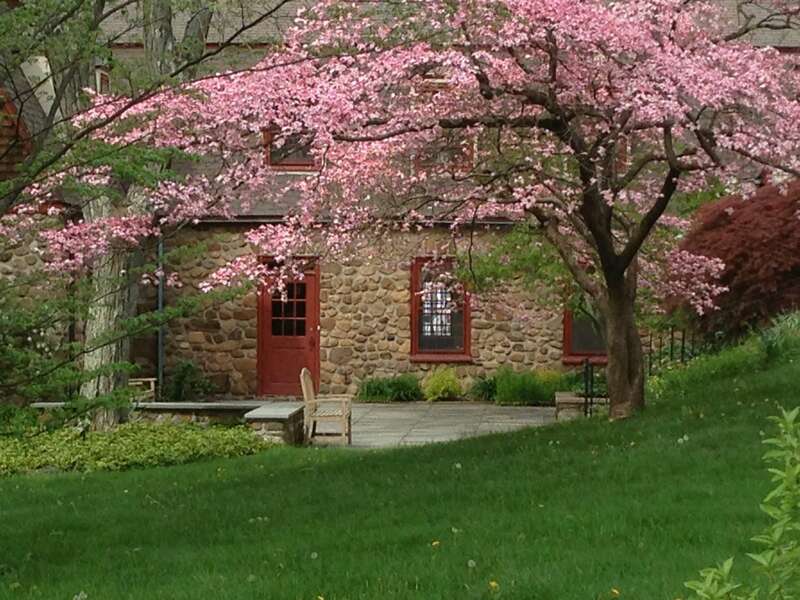 The Center hours are 10am to 5pm Tuesday – Sunday, from March through October, and 10am to 4pm Tuesday – Saturday, from November through February. 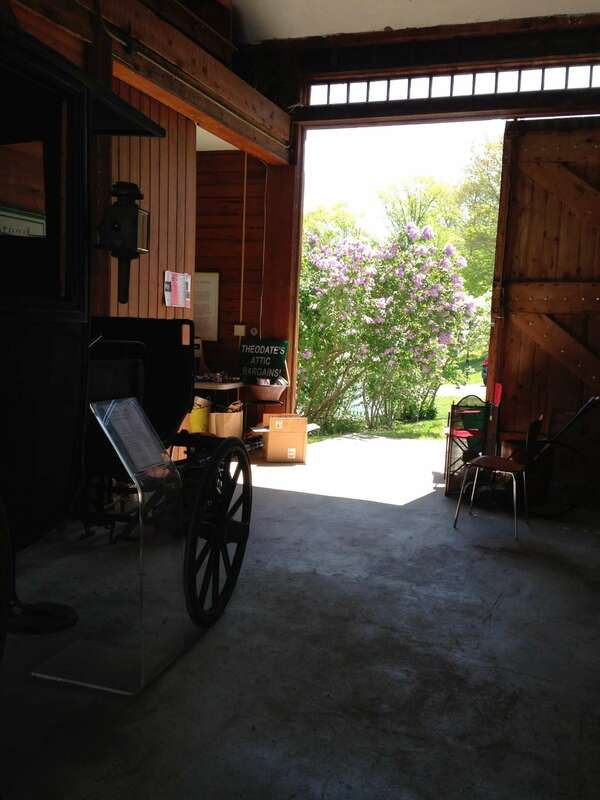 For information on programs, please contact Nature Center staff at (203) 245-8743. 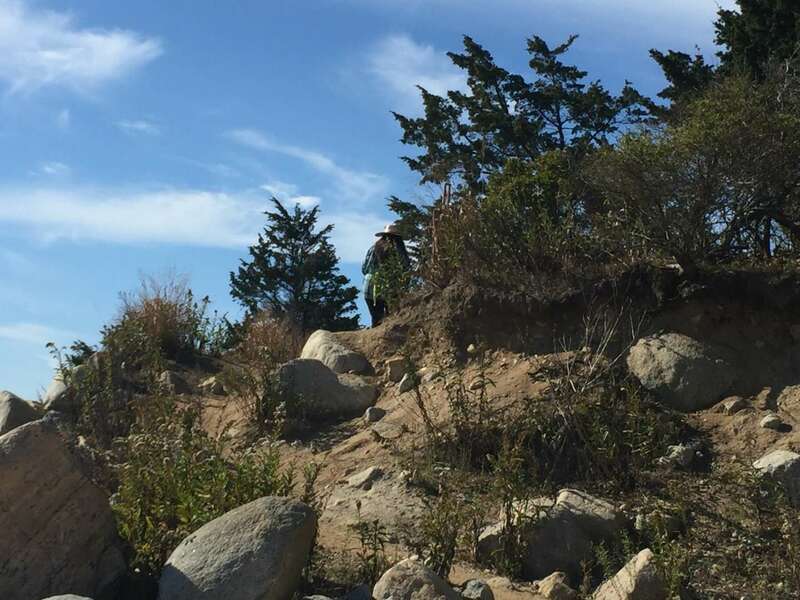 To visit the Nature Center, bear to the left at the access road rotary, go halfway around the rotary and follow the signs toward Meigs Point. 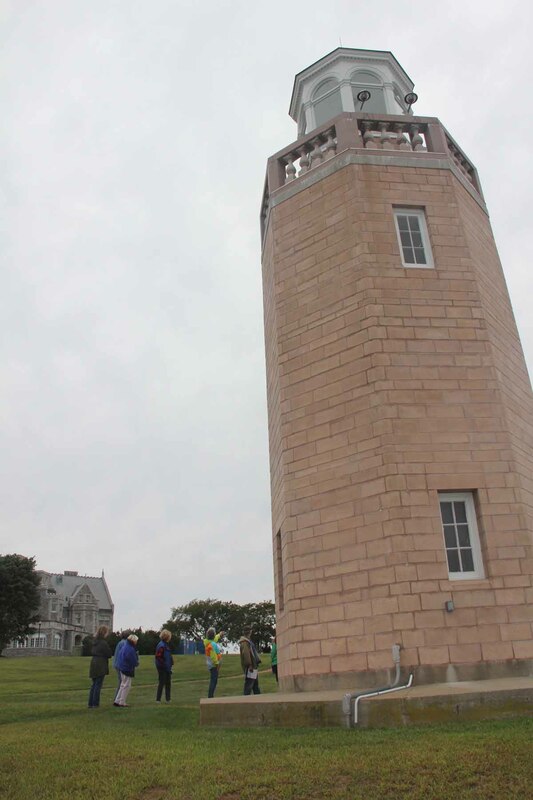 The Center is on the left across from the Meigs Point bathhouse. 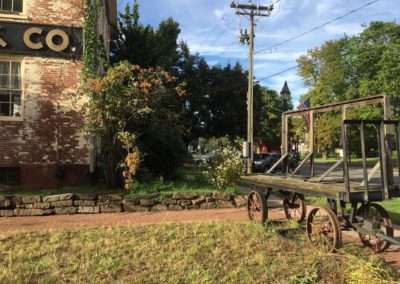 Parking is available near the building. 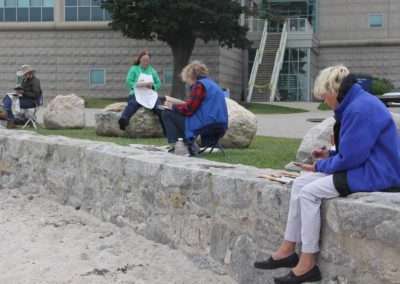 Nine members of the Connecticut Plein Air Painters Society visited UConn Avery Point on Sept. 9 at the invitation of Connecticut Sea Grant. 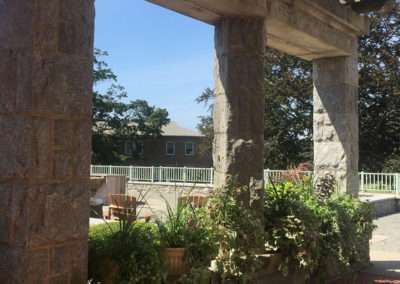 The event is part of Sea Grant’s efforts to reach out to new groups during its 30th anniversary year celebration. 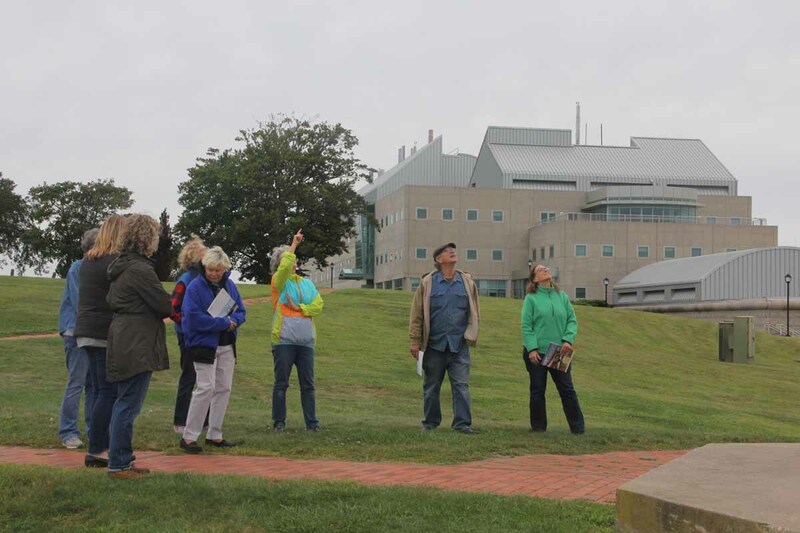 The morning began with a habitat walk around the campus, led by Judy Preston, Sea Grant’s Long Island Sound outreach coordinator. 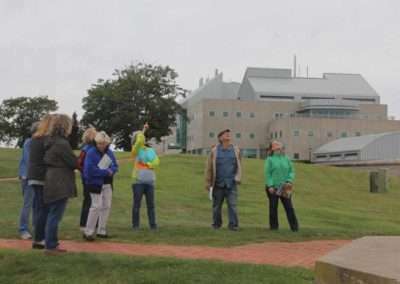 She talked about the history of the campus as well as the rocky shoreline, marsh and island habitats visible from campus. 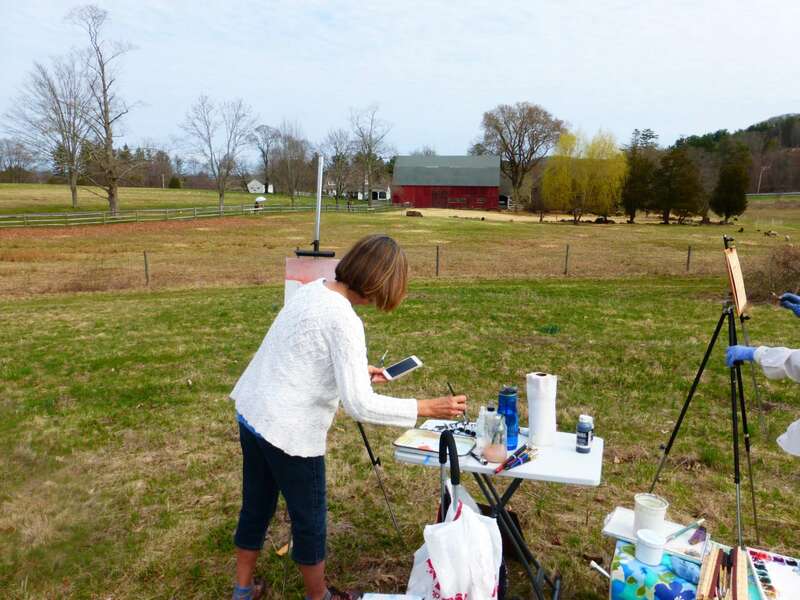 After the walk, the painters fanned out across the campus for a plein air paint-out, using oils, water colors and sketching materials. 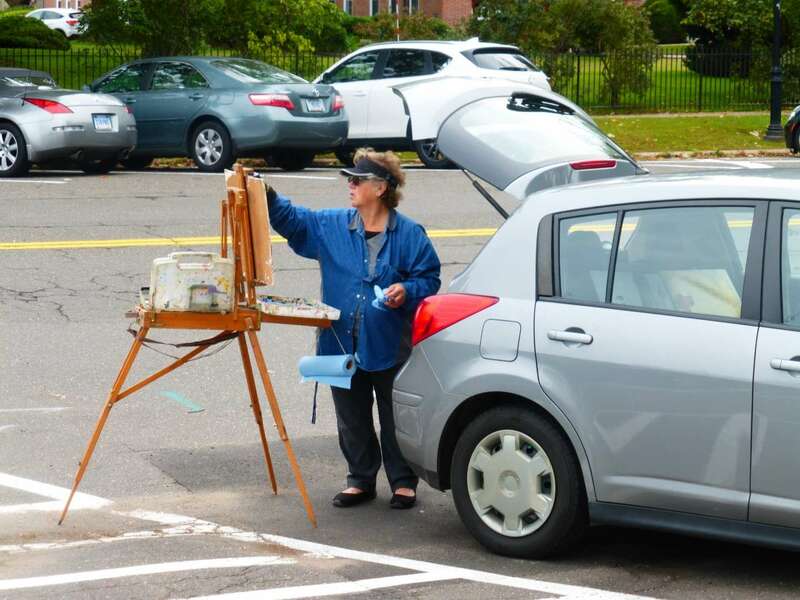 Works created during the paint-out are tentatively scheduled to be displayed on campus at a later date. 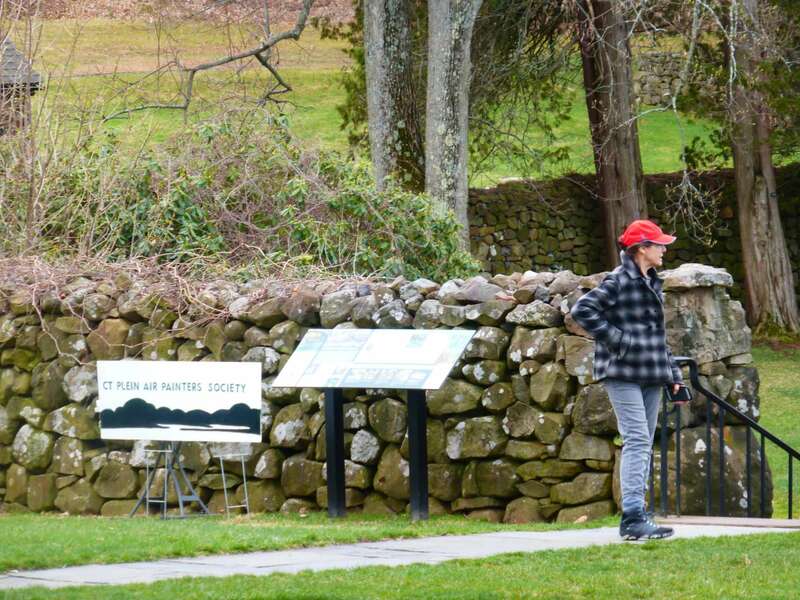 More information about the event can be found here. 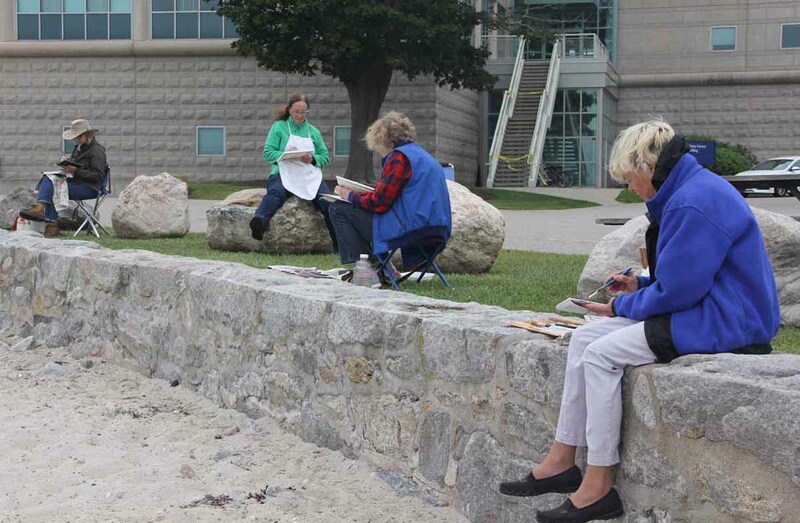 Judy Preston, center, tells members of the painters group the history of the Avery Point lighthouse. 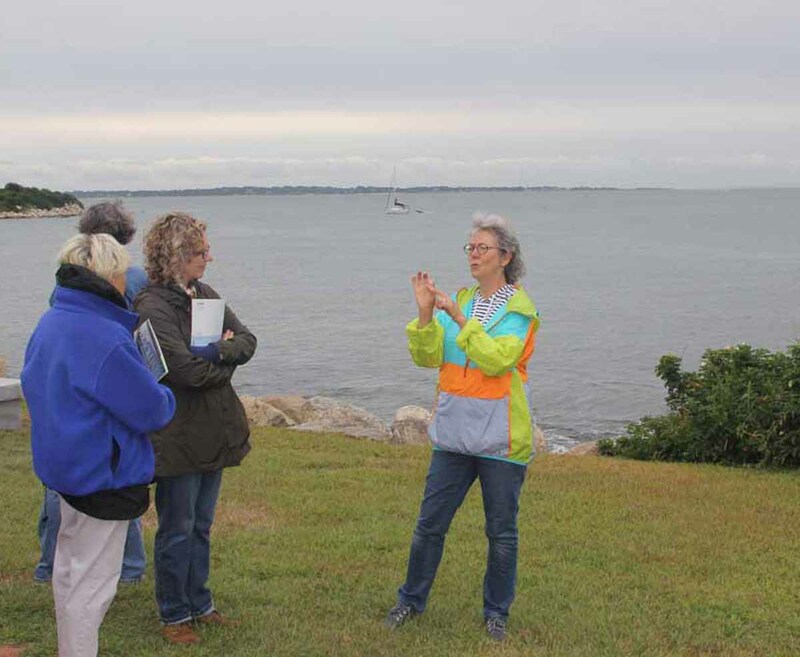 Judy Preston shared information about the history of the Avery Point campus, including the lighthouse, during the habitat walk. 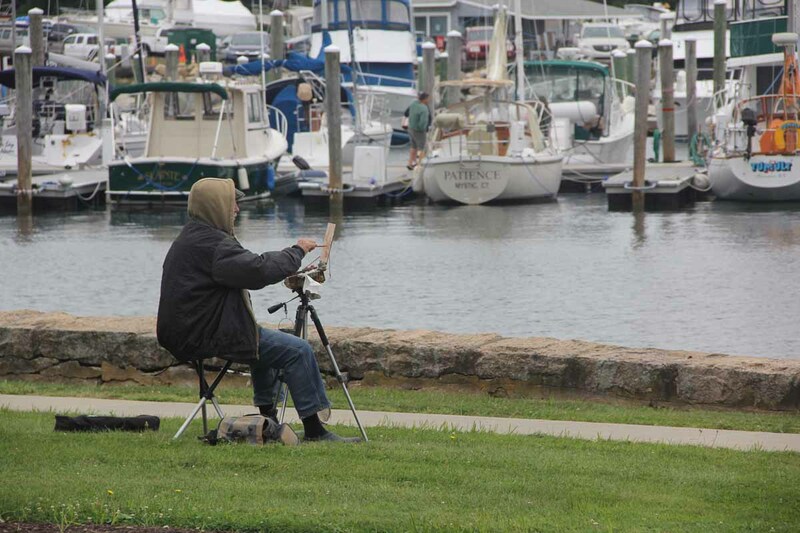 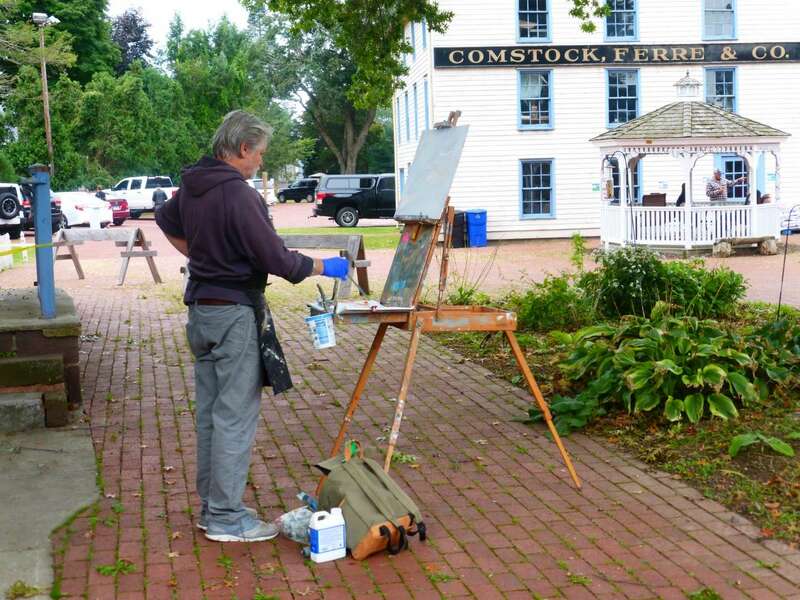 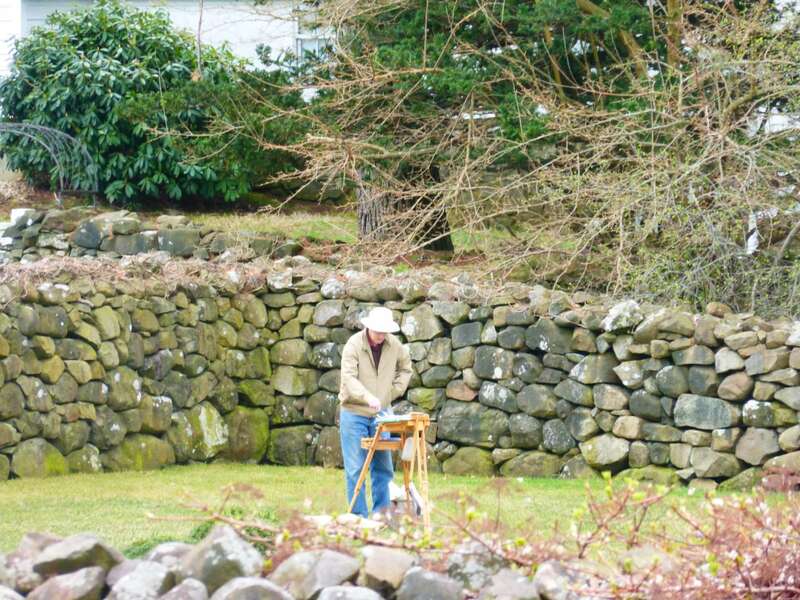 Doug Andersen of Simsbury set up his easel near the seawall between the campus and the Shennecossett Yacht Club. 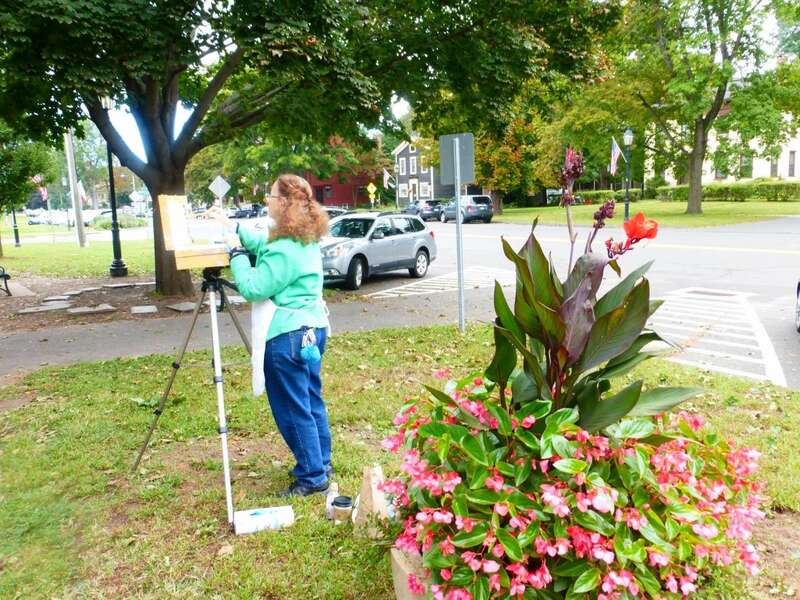 Patty Scott of Rowayton sketched a shoreline scene from under a tree in front of the Branford House. 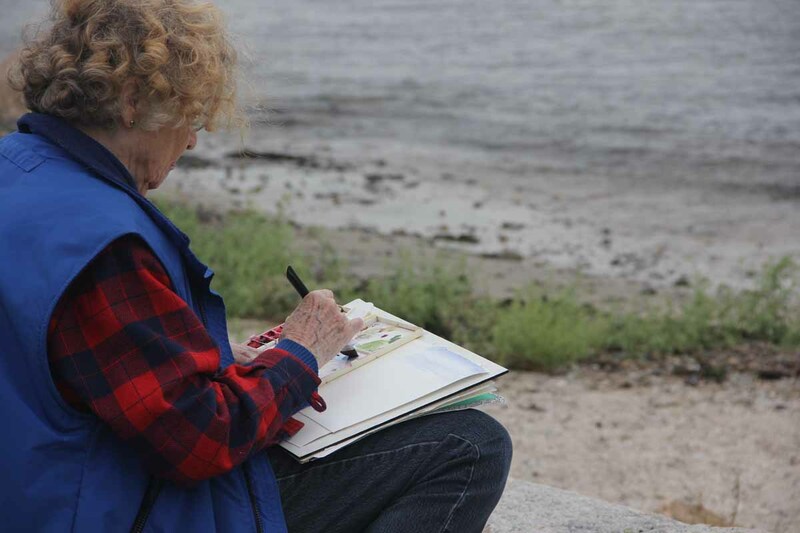 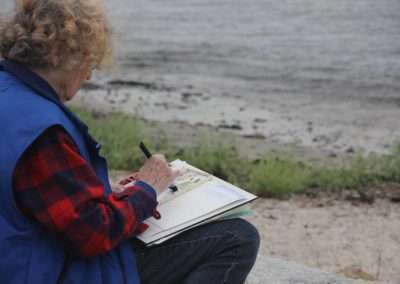 Mary Horrigan of Marlborough painted with water colors near a small sandy beach next the the Marine Sciences Building. 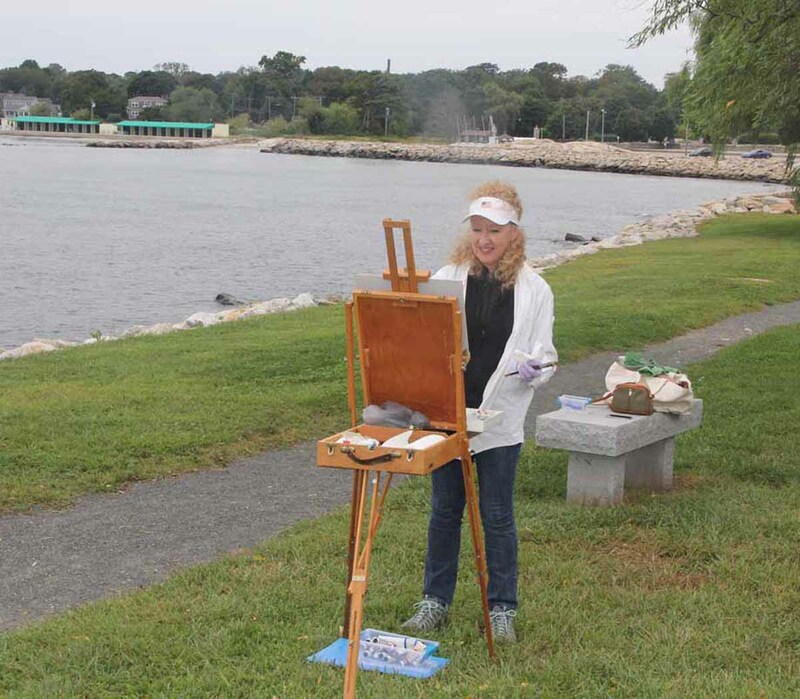 Liane Philpotts of Madison painted a scene at the mouth of the Thames River. 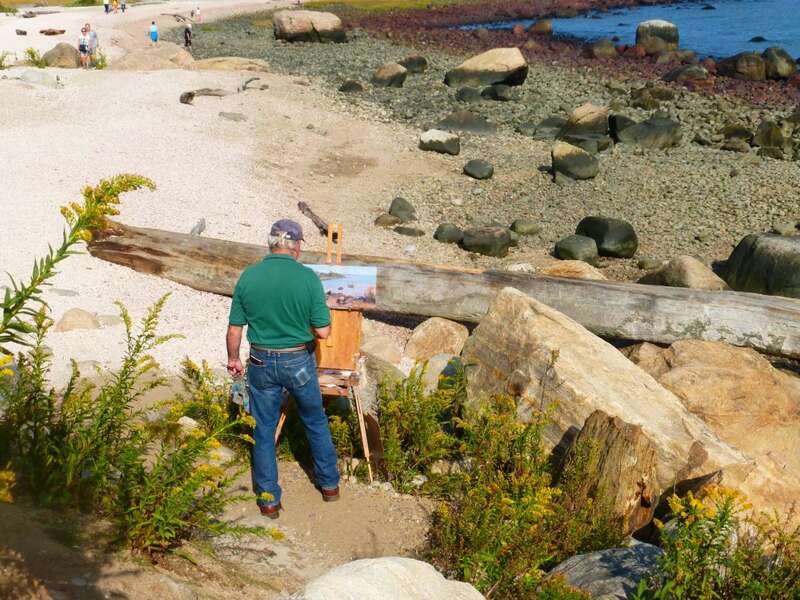 Several painters chose scenes overlooking a small sandy beach that looks out to Pine Island. 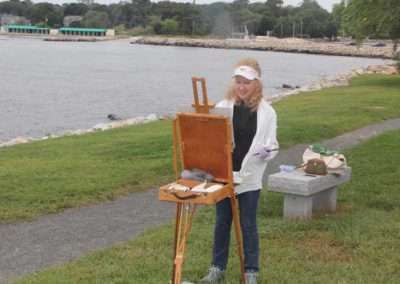 Shauna Shane of Storrs painted a scene of the Shennecossett Yacht Club and the docks at Avery Point. 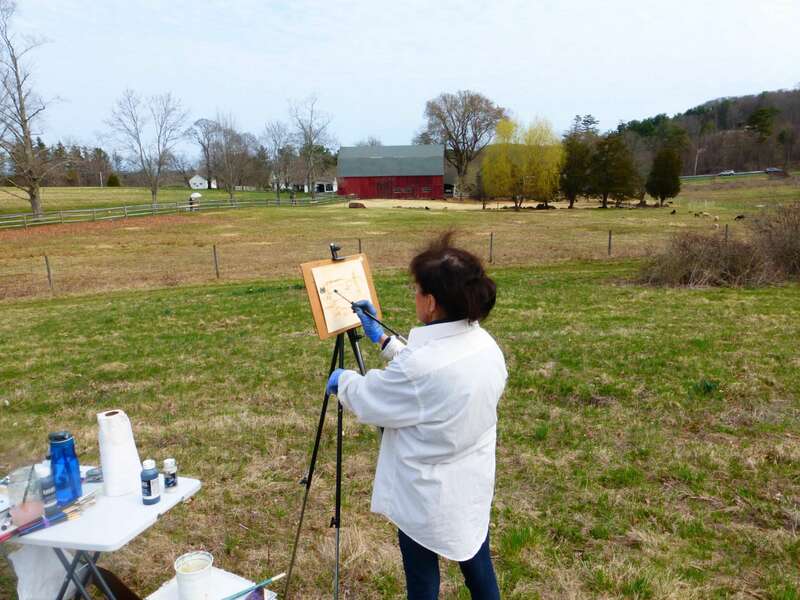 Dawn Tyler of Hebron, president of the Connecticut Plein Air Painters Society, painted from a spot next to the Rankin Lab. 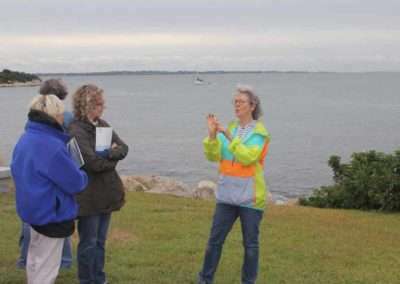 Judy Preston tells members of the painters group about the coastal habitats at Avery Point. 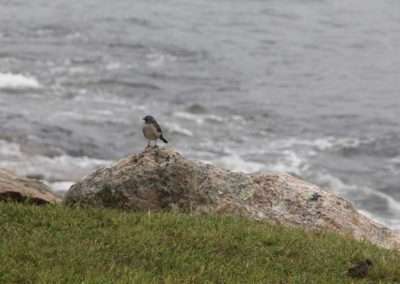 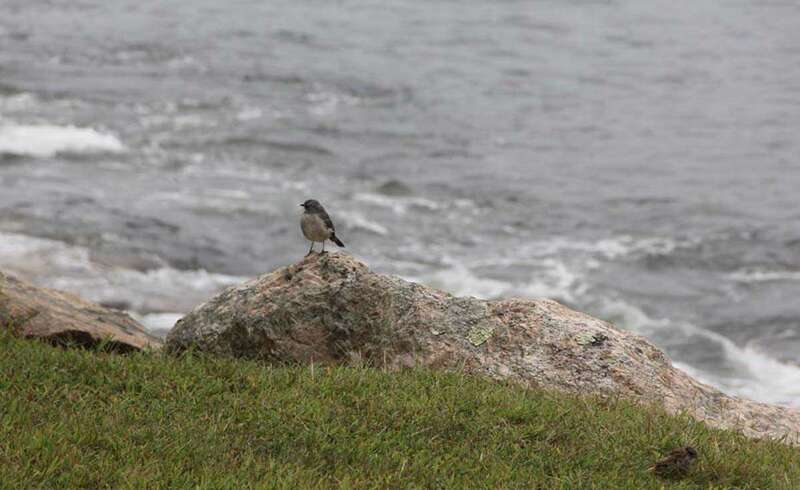 The habitat walk hugged the rocky shoreline at Avery Point, where a migratory and other bird species including this northern mockingbird often stop. 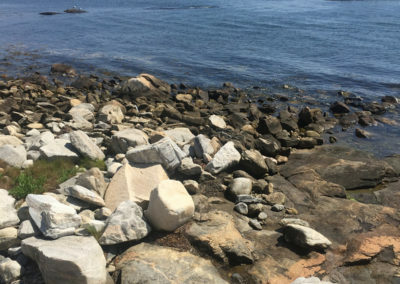 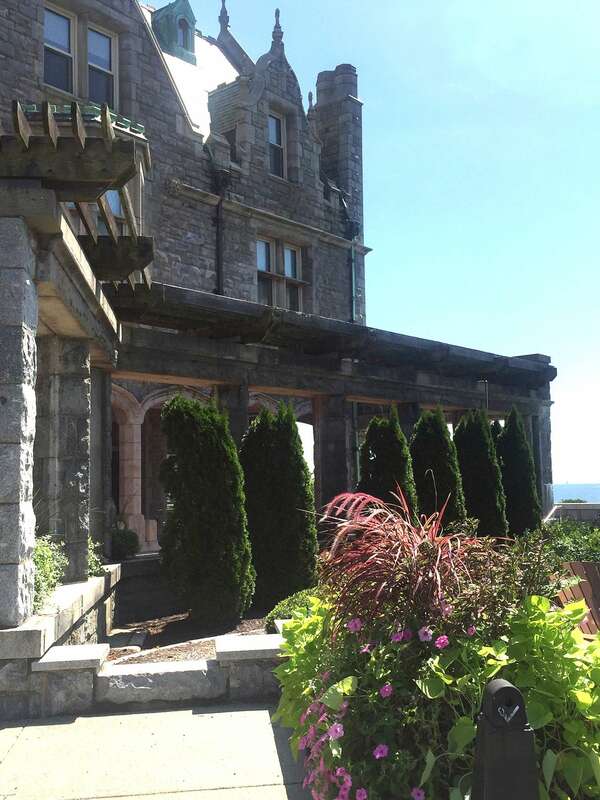 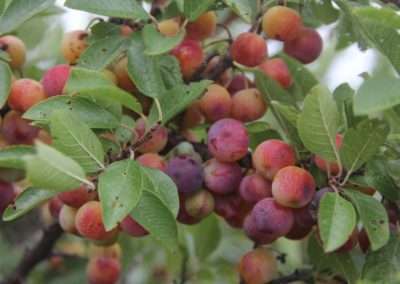 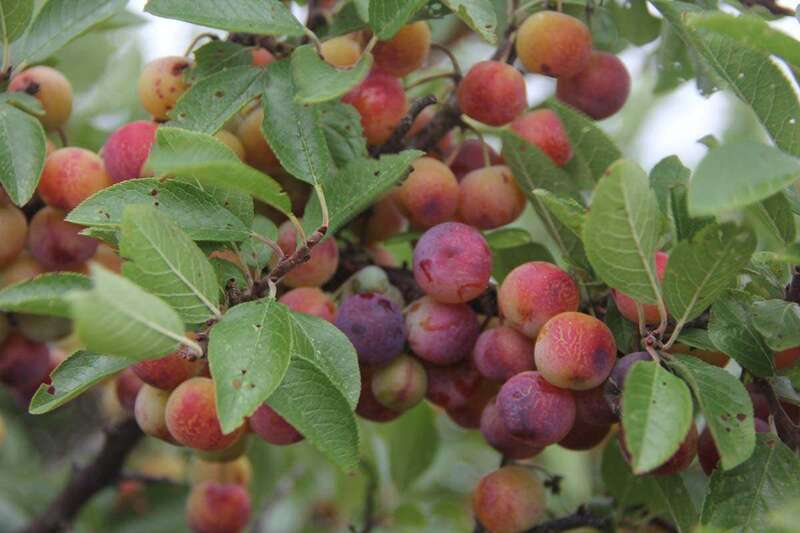 Preston pointed out two large beach plum shrubs, a native plant, that are thriving atop the grassy hill overlooking the rocky shoreline at Avery Point. 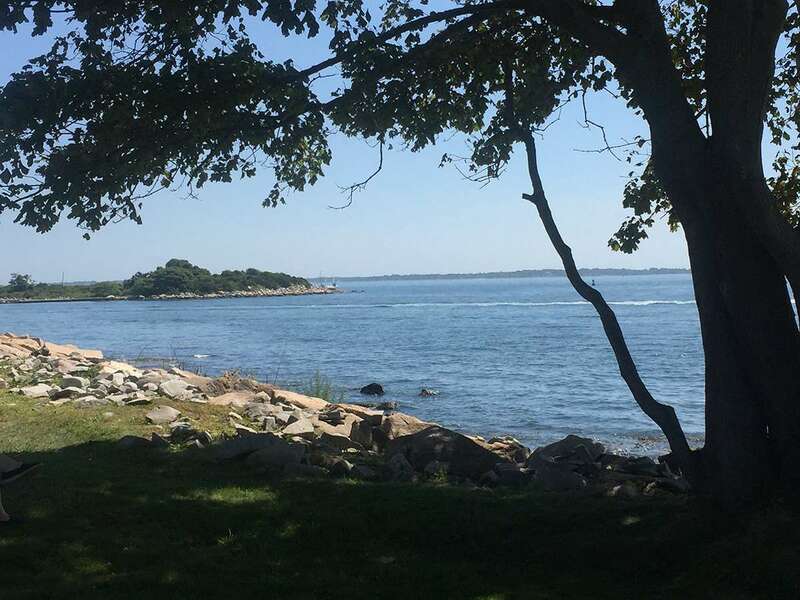 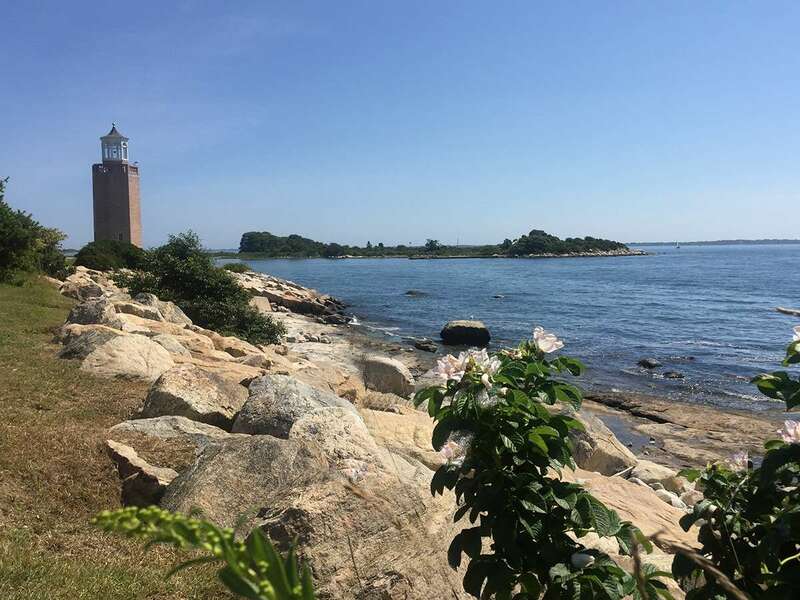 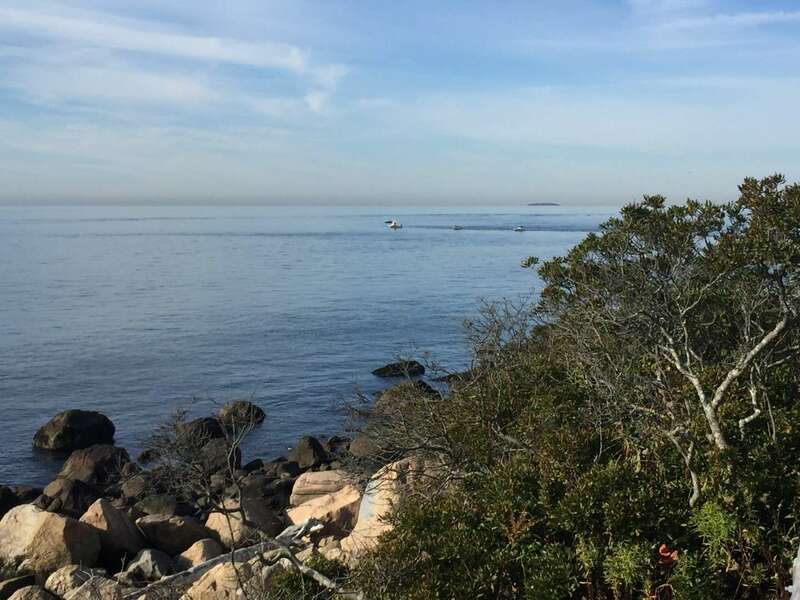 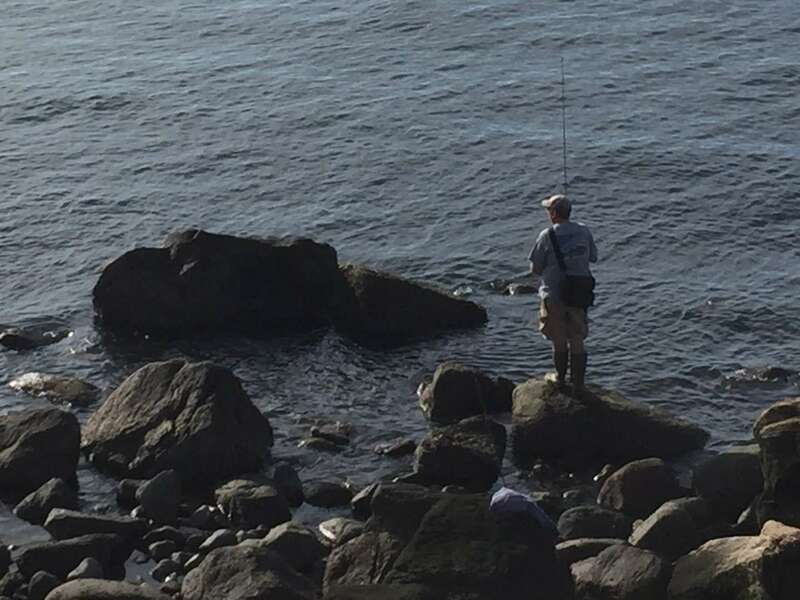 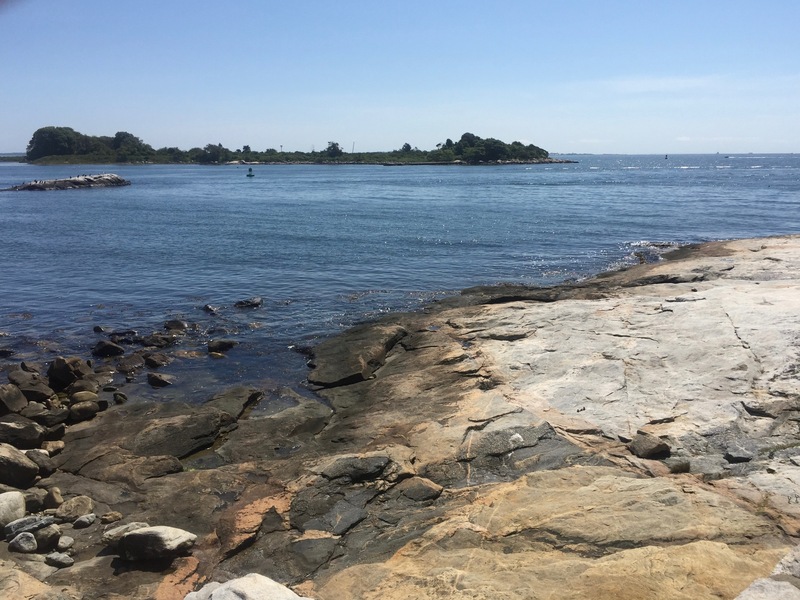 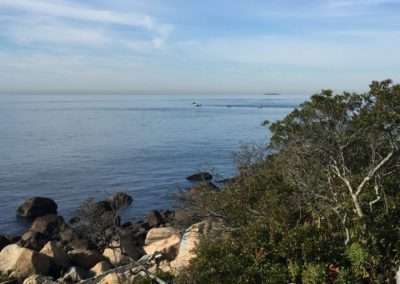 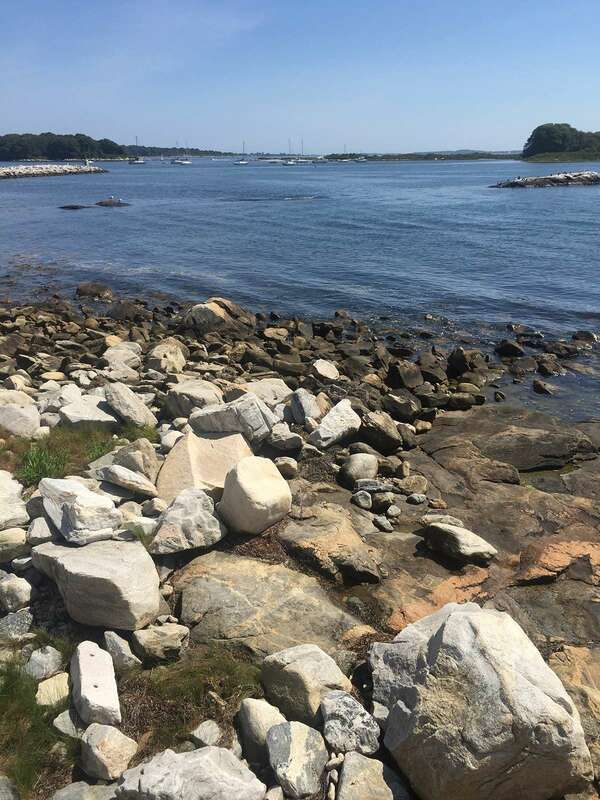 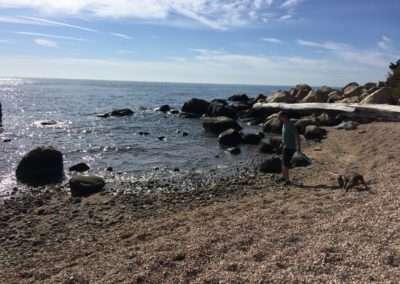 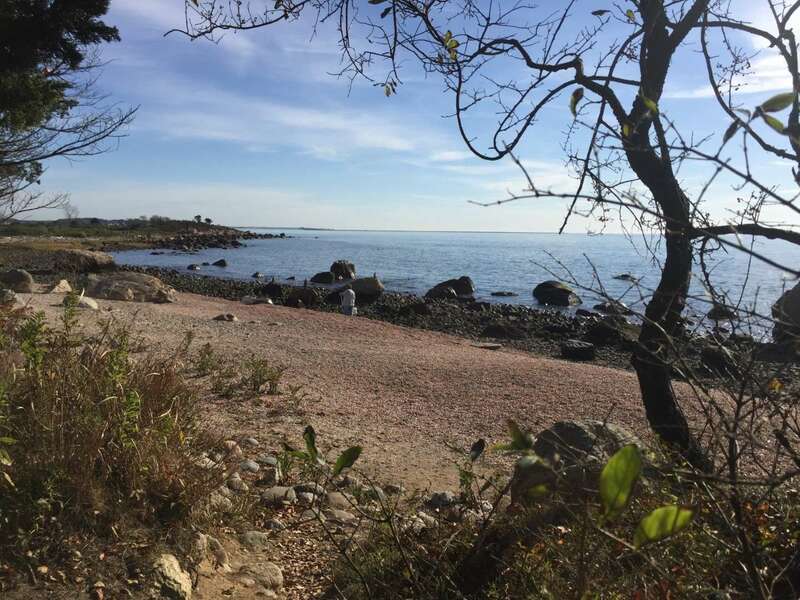 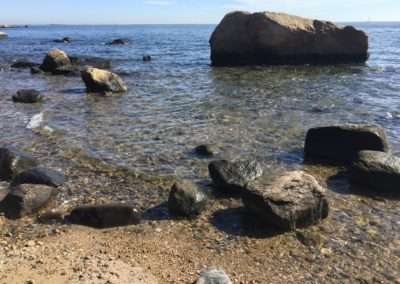 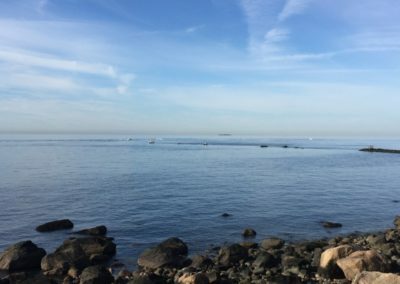 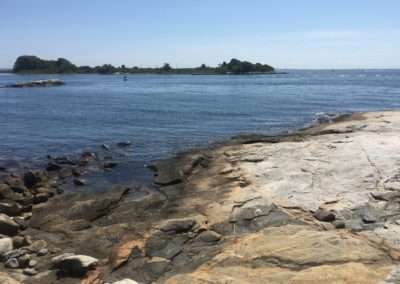 CPAPS has been invited to participate in Connecticut Sea Grant’s 30th year by painting the beautiful shoreline landscape offering rocks, waves, beach, distant islands, sailboats, and some truly spectacular architecture. 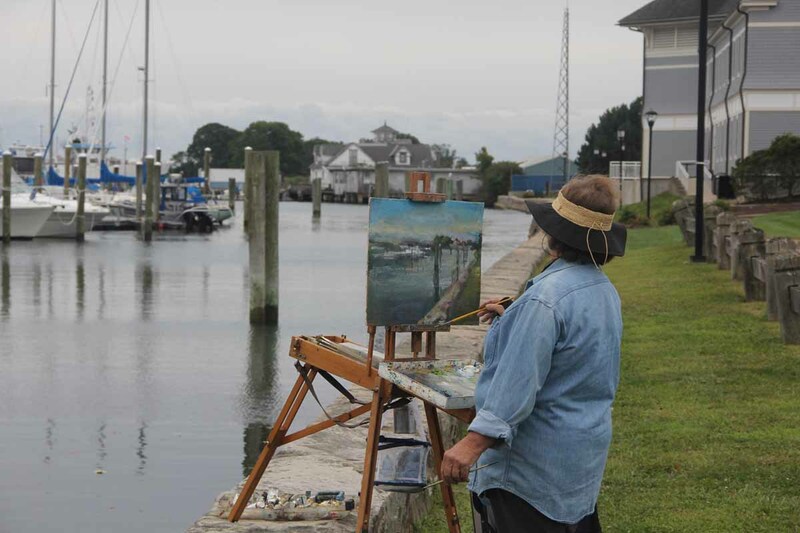 An exhibition will be held later in their gallery of the paintings from this location, so this is a paint out that should not be missed. 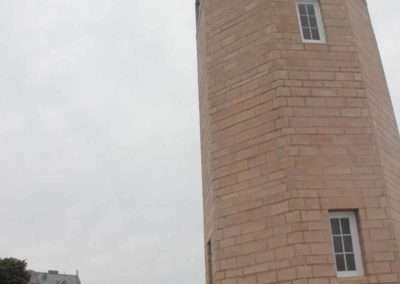 There has been full publicly for this celebration so I expect a well attended event. 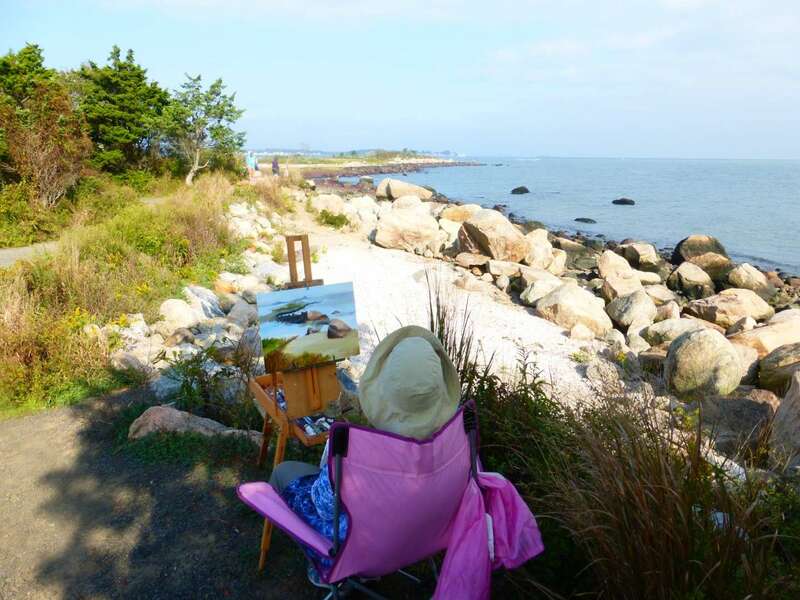 (Bring cards and perhaps a couple of small paintings?) 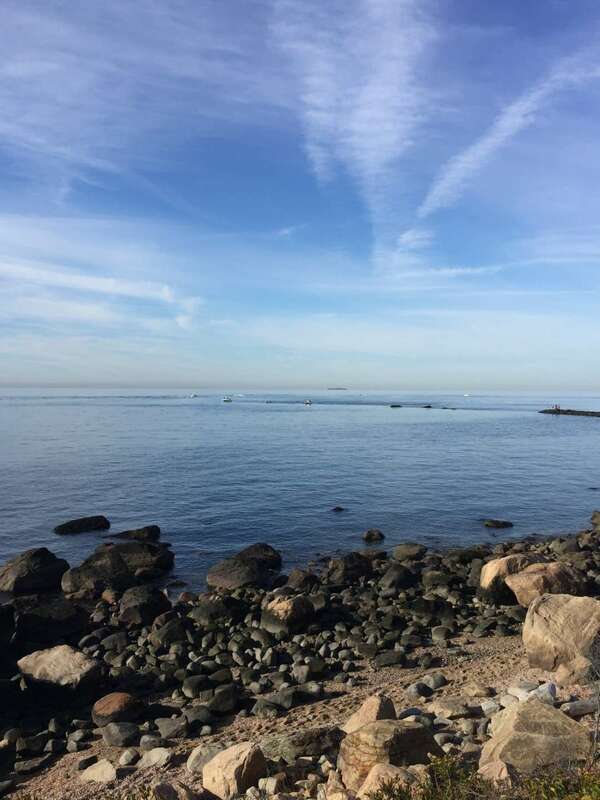 Outreach Coordinator Judy Preston will lead a free, 30-45 minute informative walk about the marine habitats visible from campus 9:00 AM. 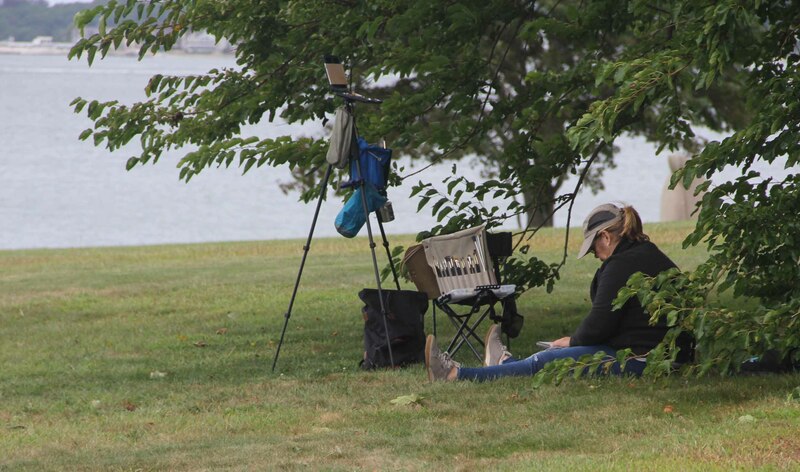 a perfect opportunity for scouting locations as well as the knowledge gained from the experience. 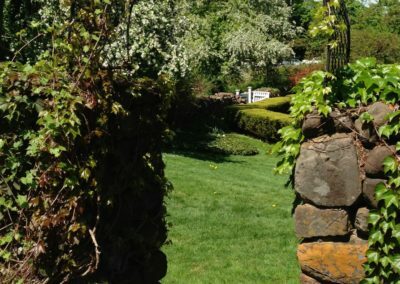 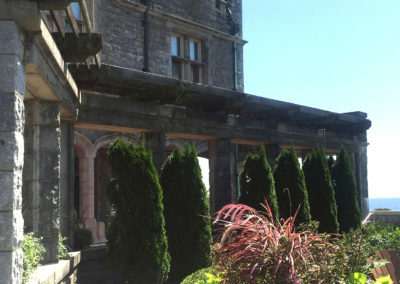 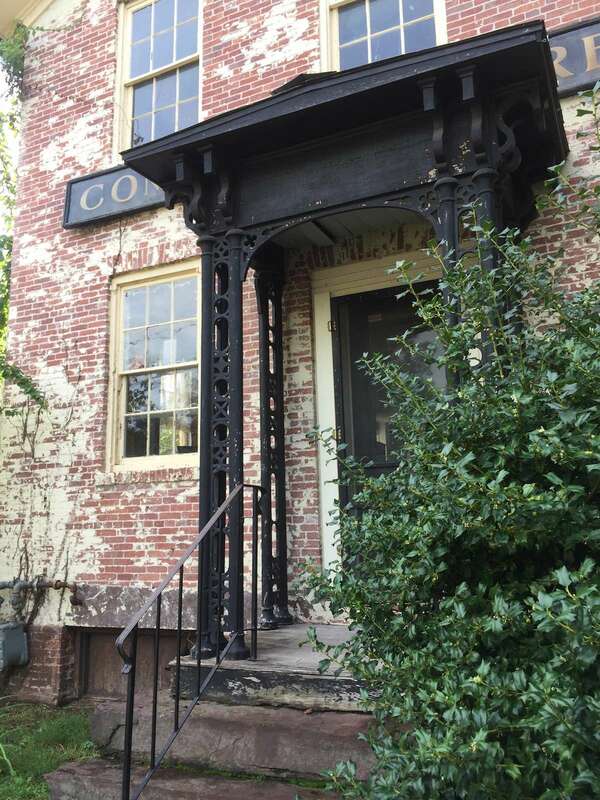 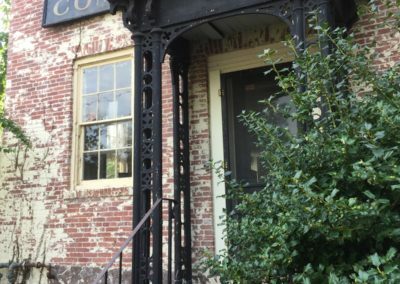 I plan on placing our sign-in table close to the Welcome Entrance on the East side of Branford House, where restrooms are available as well as a gallery accessed from the elevator to the second floor. If that changes I’ll send additional information. 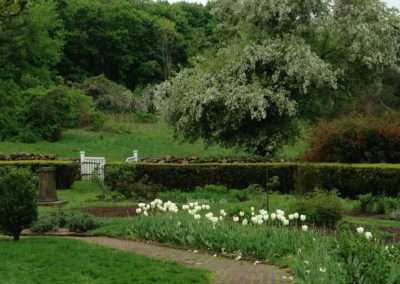 From the west (New Haven, New York) – Take I-95 N to exit 87 Clarence B. 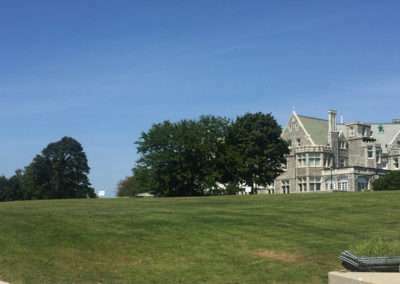 Sharp Hwy/CT-349 toward US-1 (1.9 mi). 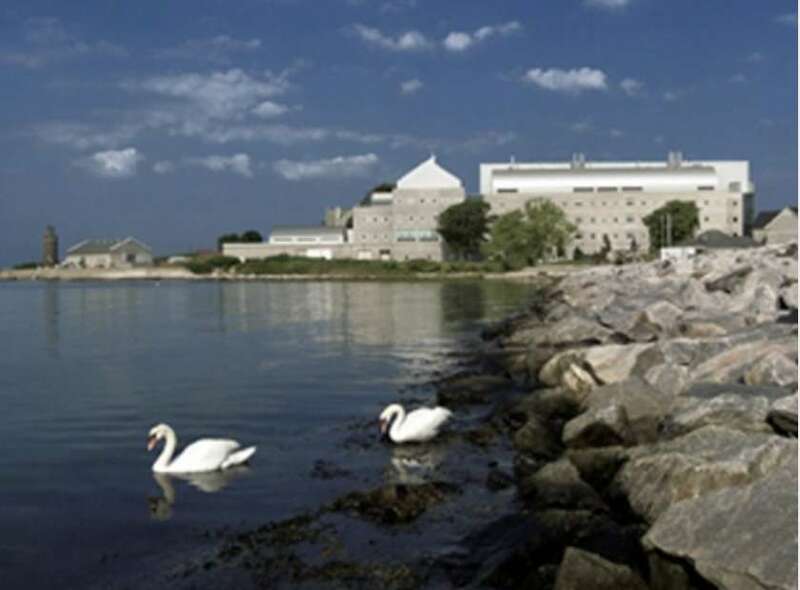 At the second set of stoplights, take a right (you will see a sign here for the University of Connecticut at Avery Point). 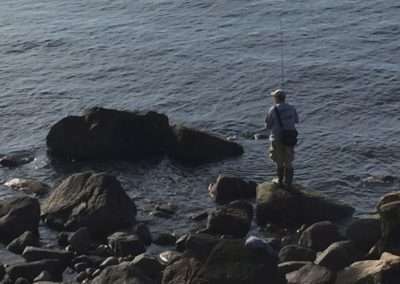 At the next corner and set of lights, take a left. 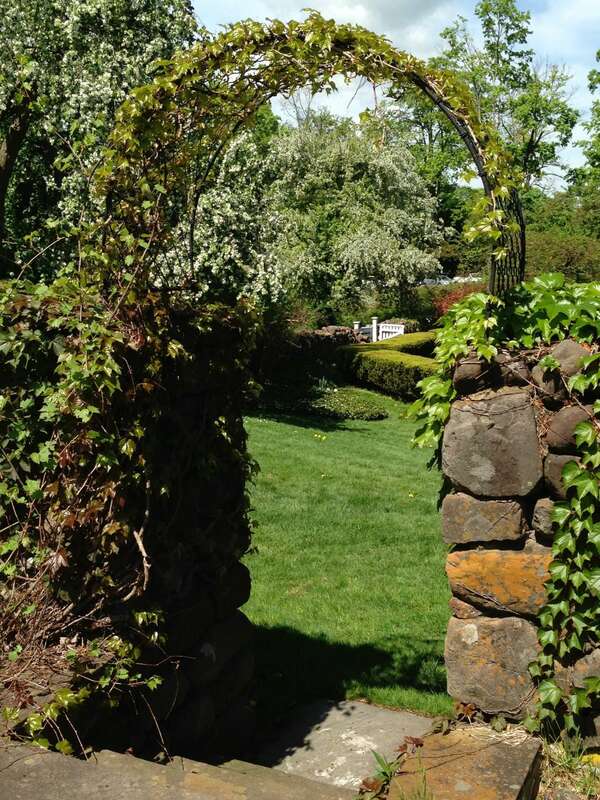 Follow this road for several miles, straight, past Pfizer and the Shennecossett Golf Course. 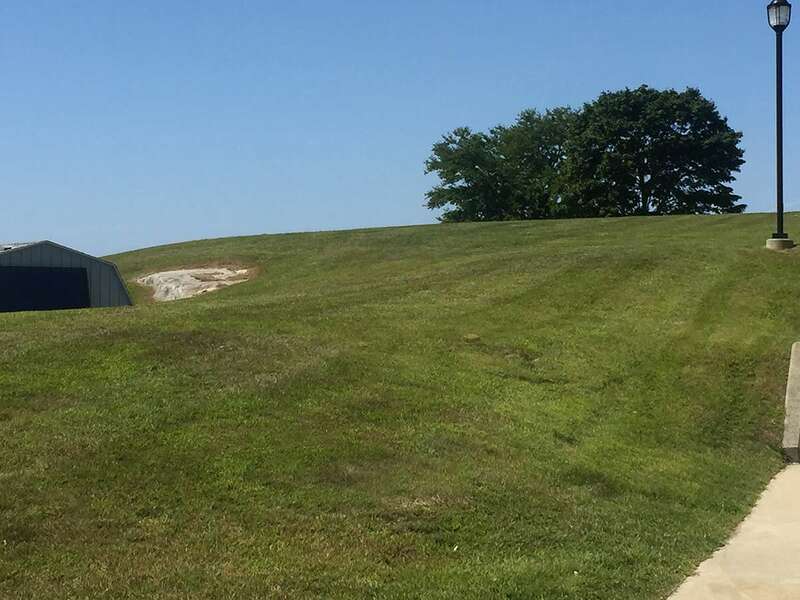 Shortly after the golf course you will come to the entrance on the right side for the University (big blue sign) just before a sharp curve. From the north (Norwich, Worcester) – Take I-395 S to exit 5 (left side exit) toward CT-32/New London (0.4 mi). 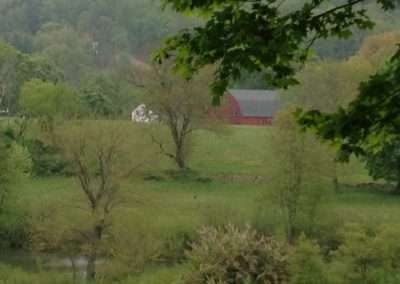 Merge onto Montville Connector (0.9 mi). Slight right at CT-32/Mohegan Avenue Parkway; continue to follow CT-32 (3.3 mi). 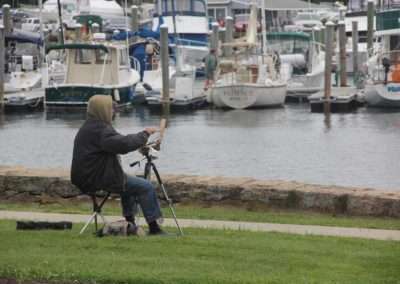 Merge onto I-95 N/US-1 N via the ramp to Providence/Groton (1.7 mi). 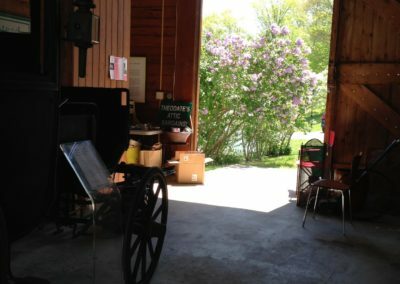 Take exit 87 Clarence B. 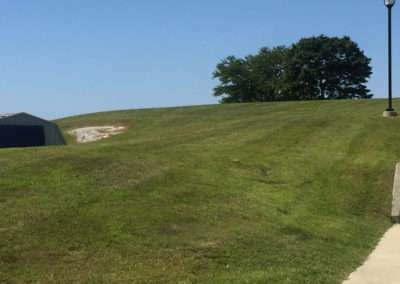 Sharp Hwy/CT-349 toward US-1 (1.9 mi). At the second set of stoplights, take a right (you will see a sign here for the University of Connecticut at Avery Point). 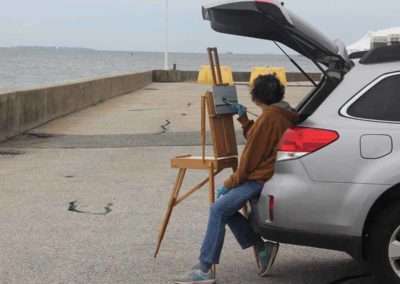 At the next corner and set of lights, take a left. 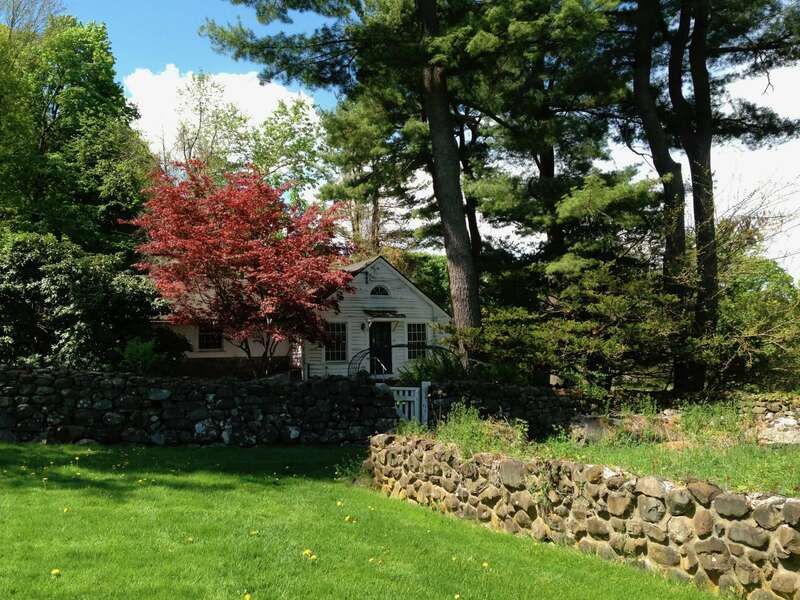 Follow this road for several miles, straight, past Pfizer and the Shennecossett Golf Course. Shortly after the golf course, you will come to the entrance on the right side for the University (big blue sign) just before a sharp curve.